I knew I couldn’t come to Sydney without going to Bills. I came here on my last visit (read review here) and I had to go again this time around, of course with my bills partner in crime, M. We went to the one in Surry Hills, there are 3 different locations – Darlinghurst, Surry Hills and Woollahra. My favourite would have to be Woollahra, but it’s further away, and a real pain to get a seat on the weekends. I thought I would get something different this time, I always get the scrambled eggs with mushroom and avocado. Last time I had this, I was suffering from food coma that I really couldn’t focus or do any work! I had a huge presentation that I needed to finish, and could not afford falling asleep at my desk! 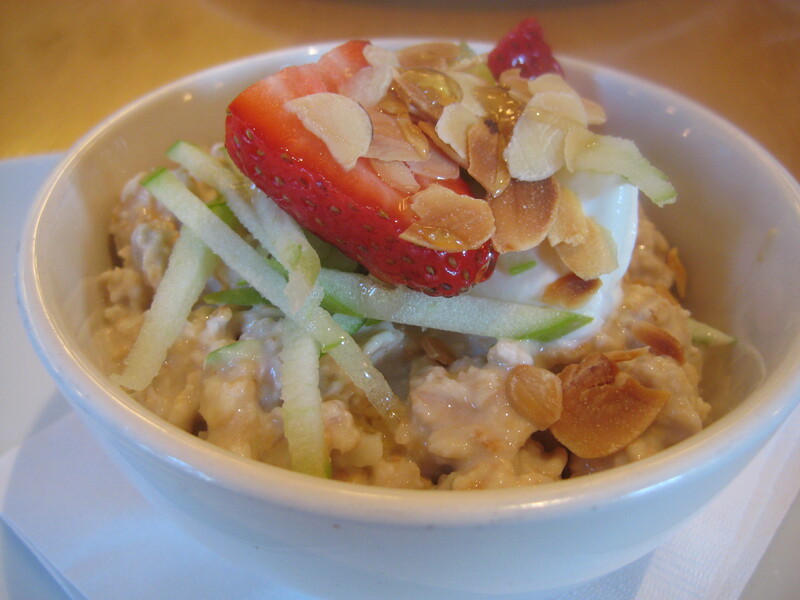 Ordered coffee – without a doubt, brain doesn’t really function without it and I ordered bircher muesli with granny smith, strawberries and almonds, topped with honey! I asked for a small bircher (to avoid morning food coma), and it was perfect. It was light, healthy and absolutely and incredibly tasty. The granny smith apple was cut thinly, almost shredded like, strawberries cut into half all topped with almonds and honey – it was a great way to stay the busy day! M ordered the usual, scrambled eggs with mushroom and avocado. She said it was ‘good’ but not as good as the Darlinghurst one as it was too watery. Looking at her eating the scrambled eggs I kind of wished I had ordered the same thing. I could have ordered the ricotta hotcakes, however, I don’t think I can stomach that early in the morning. I met M at 7.30am, and seriously, that’s just way too early to eat something that heavy! I am ‘hoping’ to go back again on a weekend, perhaps after the half marathon with my marathon buddy, J and his girlfriend, N.
Is the bircher as good as café belgenny (read review here)? Well they are both different. Café Belgenny’s bircher muesli is not as dry, it is a lot more soggier and has a lot more fruits and yogurt. Bear in mind, I did order a ‘small’ so it wasn’t that big. Nevertheless, both are still pretty good, however, I would probably lean towards Café Belgenny’s bircher more.